The following letter was written by Gen. Charles Krulak to the late Senator John McCain. Gen. Krulak, a past president of Birmingham-Southern College and former member of the Joint Chiefs of Staff, knew Senator McCain personally. Below is the letter Gen. Krulak says he wishes he had written before Senator McCain passed away. We have served together for years. Our fathers served together for years. As Oliver Wendall Holmes famously said, “We have shared the incommunicable experience of war.” Our wars together have been in uniform and in the corridors of power in Washington… mine in the Pentagon and yours on the Hill. Over the years, I watched in awe as you selflessly served your Nation and upheld the values that we all claim to cherish but often, by our actions, put on the back shelf. When I think of you, the word that comes to mind is “Character.” You truly epitomize the concept of a man or woman of character. You and I have discussed with deep concern the fact that many believe that the only thing that truly counts… in the military, business or politics… is the “bottom line”… that a leader’s character doesn’t matter. You have shown throughout your life that this is wrong. You have proven that it is impossible to lead if you are deficient in the character department. You have shown through your actions that whether you are in the midst of a military or political fire-fight, people will cling to leaders they know they can trust… those who are not detached, but involved and those who have consciences… who stand for something bigger than themselves… those who do not dodge unpleasantness but have the moral courage, integrity, and strength of character to do what they know in their hearts to be the right thing. You once shared with me that subordinates will make the call on whether or not they will follow you long before hard times hit… that they watch you every minute of the day and take stock of everything you do. You proved, on multiple occasions, that you can stumble and make a bad decision or two and still recover in their eyes. But if a person shows themselves to be a man or woman of poor character, neither your people nor your contemporaries will ever trust you when the going gets tough and if they don’t trust you, they won’t follow you, and you will get beaten in the fire-fights where only teamwork can carry the day. 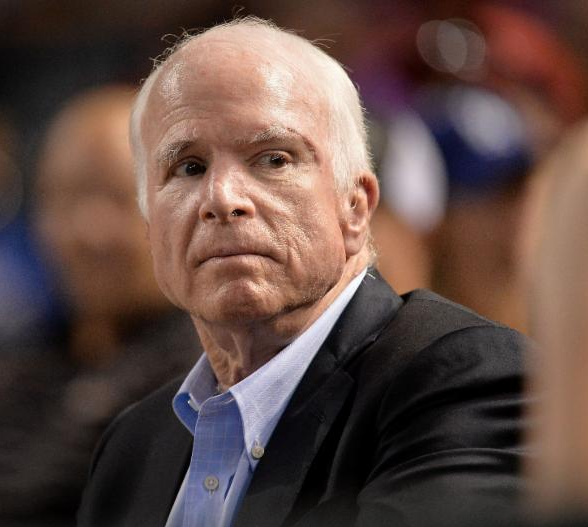 Click for more on Senator John McCain.